As we head into the last quarter of 2015, it’s time to get ready for Google SEO trends in 2016. Google, the number search engine in the world, always keeps us on our toes! Search engine optimization looks very different today than it did 5 years ago. 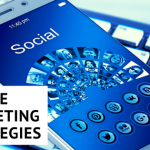 With its algorithm updates and other changes over the years, staying on top of what is shaping the future of Google SEO is a must! As a content marketer, keep your finger on the pulse of what’s driving search engine optimization in 2016. Get instant access to SEO secrets from a 7-figure blogger and SEO expert! Technology changes fast these days. Here are three important Google SEO trends to pay attention to in preparation for 2016. Back in March, I talked about Google’s newest algorithm which favors mobile-friendly website and penalizes those that are not. Well, that’s still true more than ever! So make sure you check your website out at the Mobile Friendly test and get compliant. Use responsive website designs for optimal viewing across a range of devices: computers, tablets, and smartphones. In 2016, searches using mobile devices will exceed desktop. Voice is becoming more and more popular for search. With Google Now, Apple Siri, and Windows Contana, speaking your search term is very common. Voice search on mobile devices is changing the way we search and the patterns that we use. 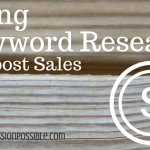 As part of your SEO keyword research, long tail keywords will become more important than ever. That’s a good thing since they are more targeted. As the number two search engine in the world, video consumption is increasing in leaps and bounds. By 2016, video viewing is expected to increase by 19.8% according to Zenithoptimedia. With mobile at the forefront of video viewing, it’s expected to reach 52.7% in 2016. With that in mind, it’s smart to add a strong video marketing strategy to your business plan. YouTube is expected to account for over half of search traffic. By embedding your videos in your blog posts, visitors will stay on your website longer. This will help you to expand your audience to people who prefer video over reading. Be sure to use video SEO technique so they rank well in search. Paying more attention to visual content is another important aspect for Google SEO trends in 2016. You can increase website traffic with visual content like images and infographics. These elements will keep visitors on your website longer but they also rank high in Google. Be sure to optimize your images. Google’s main objective is always to serve the searcher. As Google SEO search continues to transition with changing search patterns, you must also tweak a few things. Google SEO trends in 2016 is all about adapting to change and focusing on how useful your content is. SEO is much more than keywords and tricks to get on the first page of search! I used to think SEO was something boring and not needed to be learned when I first began. How wrong I was. This post is awesome Lisa and thanks for sharing your knowledge on this important subject. I’m getting better and better at SEO… and then Google set in…. just when you thought it was safe….. I remember having to take CE courses when I was in Real Estate to stay up on the current changing industry…. Now we have to do the same thing to keep up with the changing SEO algorithms…. great post Lisa… thanks for sharing.. 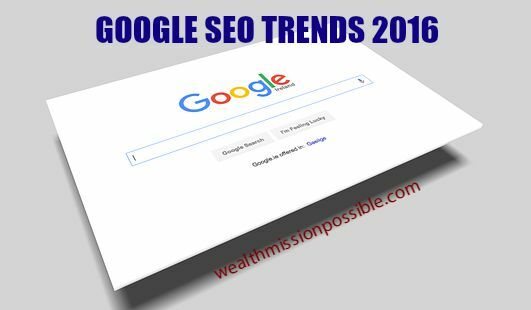 Thanks for sharing this comprehensive and detailed post on Google SEO trends for 2016 🙂 Awesome information and always good to know for us bloggers 🙂 Great post!! Great post, Lisa. I definitely needed to see this as I’m no SEO guru but realize how important it is. Thanks! It sure can be hard to keep up with all the changes Google makes throughout the year. This post really hit home, thank you! One thing I had not thought of was Voice Search & Long Tail Keywords. That opens up a whole new thought process on blog post titles. I have another friend in the biz who told me just the other day, this is the first year that YouTube had more searches than Google web search. Is that possible? I know it will be that way one day, I just didn’t think it would have been so soon. Thanks for always posting such great content, I love the video’s too! Thanks Richard! I appreciate your comment. Keeping up with Google is a job! Yes to YouTube search. By 2016 those searches will be well past the halfway mark I’m sure. Interesting…when I check my YouTube stats, the majority of searches come from YouTube and not Google search (even though those videos rank in Google). By 2017, video consumption will far surpass reading! Thank you Lisa. I never heard before about the “voice searching”, sounds extraordinary. Thank you for your recommendations, I see I have a lot of work to do in my blog, for example: the videos! That´s why I love reading your Tips. Thank you again! Thanks for commenting Sonia! I don’t use the voice search too much as I’m always looking to converse battery power. But it’s quite popular. It amazes me how people change and then technology follows to adapt to those changes. i think mobile optimization will be most important factor in SEO 2016.